Ophelia is a fictional character from the ingenious pen of Shakespeare. She is a victim of the patriarchal system, an object to be used and cast away. Torn between her condemned love to Hamlet and her blind obedience to her father, she eventually drove herself to madness and drowned silently in sorrow. Under her father’s command, she orchestrated a lie and facilitated the spying on Hamlet. When her deception was uncovered, she was accused by her lover as a cheater, a “breeder of sinners”, and was asked to join a “nunnery” (an Elizabethan slang for brothel). Heartbroken and dejected, she died dramatically when she fell from a willow tree into a flowing brook. Ophelia hence fulfilled her role as a dutiful daughter, yet suffered the loss of the love that she once steadfastly held fast. 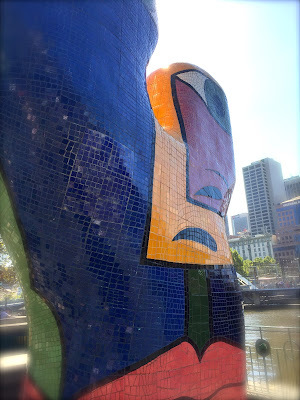 Sitting at the Southgate Complex in Southbank, the sculpture of Ophelia overlooks the Yarra River enigmatically in her distorted form. Adorned with brightly colourful mosaic tiles, she is hard to be missed and almost impossible to be deciphered. 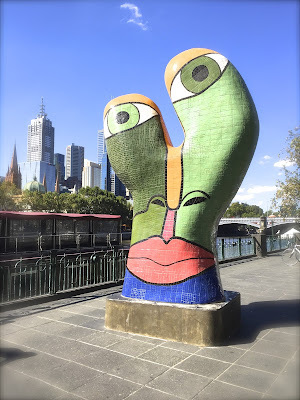 She was once the “face of Melbourne”, perhaps controversially so, yet it was not hard to imagine her being the talk of town. She is confused and crazy, desperate yet resigned. She is metaphorical, surreal, and full of inexplicable emotions. Meet Ophelia of Melbourne, the prominent woman that watches over the river.